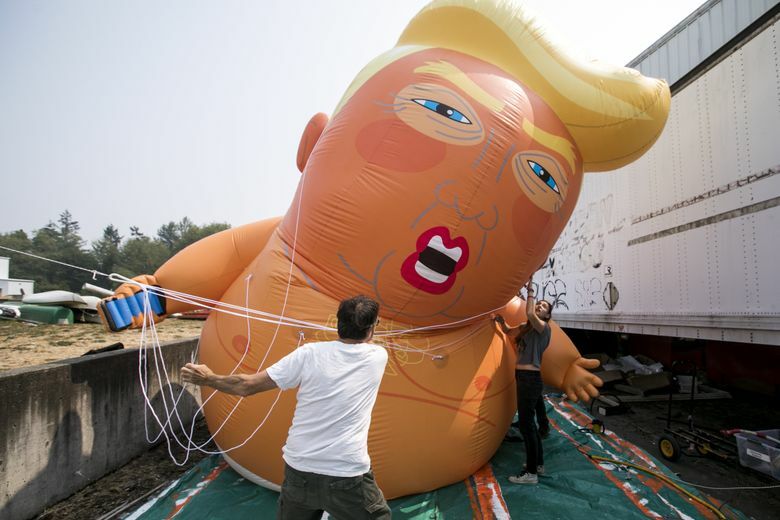 The exact duplicate of the inflatable 20-foot “Trump Baby” that made worldwide news in July during President Donald Trump’s visit to London has arrived on Vashon Island. It passed its test inflation on Monday and now a tour is being planned. 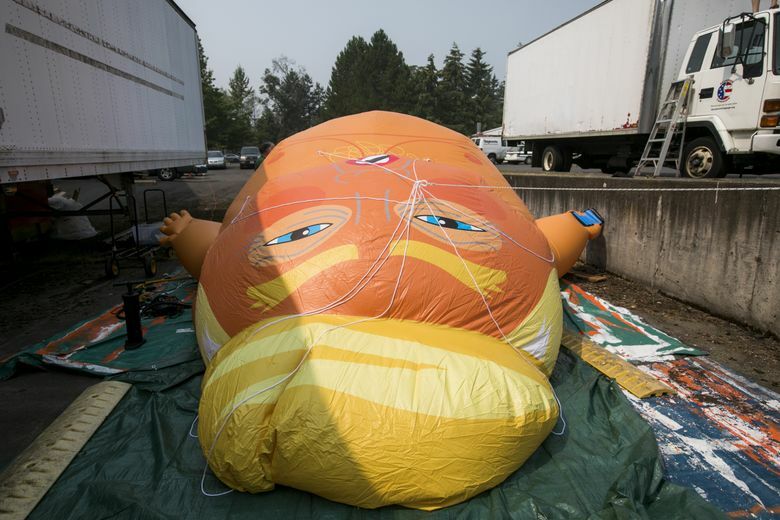 VASHON ISLAND — You know that inflatable 20-foot “Trump Baby” blimp that made worldwide news in July during the president’s visit to London? Its duplicate just arrived here and is stored in a Vashon warehouse. 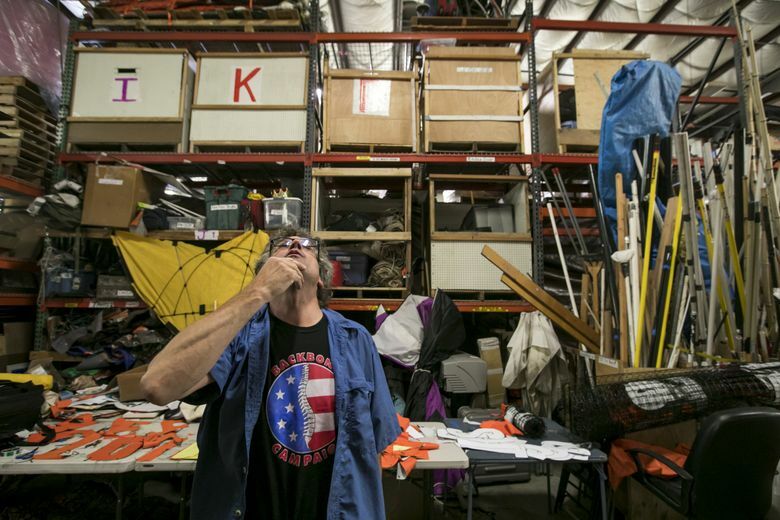 The owners of the blimp, the Backbone Campaign, which specializes in what it calls “creative strategic action to deliver power to We the People,” is working out the details of where and how it’ll be displayed. There is the matter, for example, of the $2,025 estimated cost to fill it up with helium. The inflatable came out of its 2-foot-square cardboard box on Monday afternoon for its first test run. It was filled with air using portable vacuum cleaners with reverse flow, and a high-school kid sweating over a manual air pump. It took more than half an hour, but at the end, there was a Trump Baby, although it didn’t float aloft because of the absence of helium. The blimp, or balloon — take your pick — was made by Imagine Inflatables, the firm that manufactured the original. 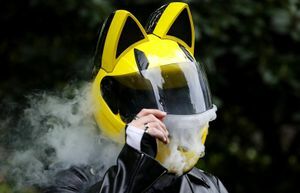 It’s a family-run company in Lutterworth, England, that makes everything from inflatable giant gorillas to life-size inflatable cars (for some reason, the most popular model is the VW Golf). It got here because of a Facebook post on July 16 by Bill Pope, a former corporate attorney for Microsoft, who also worked as general counsel for Paul Allen’s Vulcan. Since 1994 he has owned the Mazama Country Inn in the Methow Valley and has been a longtime environmental activist. 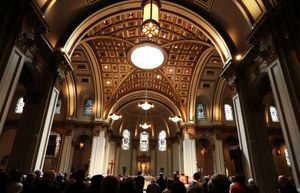 Within three or four days, Pope says, he had collected the $4,500, in 20 donations from $100 to $500 each. “Lot of people were motivated,” he says. After that, Pope had to find a group who could handle putting Trump Baby to its best use and had the skills to do so. Trump himself made reference to the original balloon during his visit to the Britain, saying that protests like the one in the British capital made him feel unwelcome. “I guess when they put out blimps to make me feel unwelcome, no reason for me to go to London,” he told the Sun newspaper. Since that first Trump Baby showing in London, the idea of using such a blimp has spread. The Trump Baby at Vashon isn’t the only one now in the United States. A group in New Jersey has announced it has been delivered two Trump Babies and expects four more. But those blimps don’t appear to be manufactured by the U.K. firm that made the original one. For now, the Backbone Campaign has plenty to figure out. There are considerations about keeping the blimp partially inflated to save on helium costs. And then there are the public-relations aspects. Pope says he’d love to see the Trump Baby make an appearance in Eastern Washington. “Although obviously, that would not be as popular a concept,” he says.